SEVEN returns to Sacramento on October 4, 2015. The regional premiere performance in February was sold out weeks in advance, leaving unmet demand for tickets. 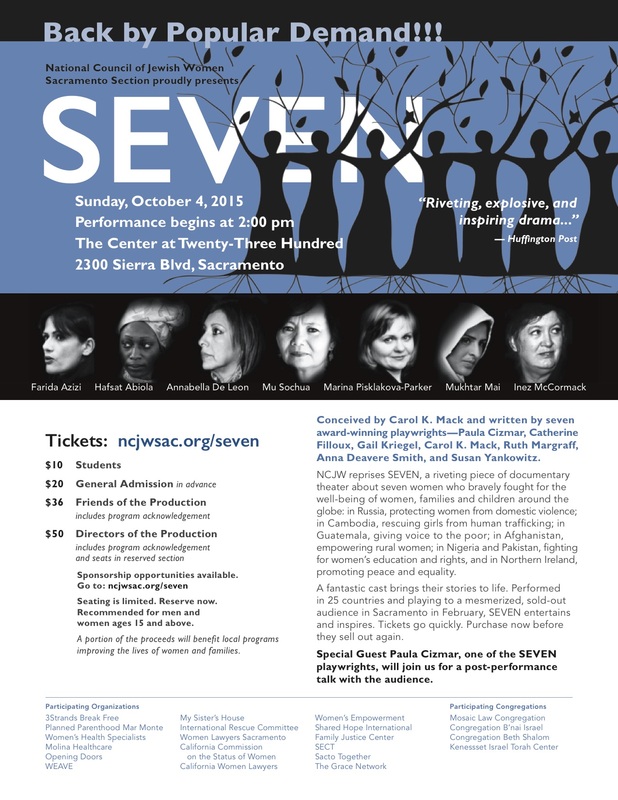 In response to strong support for another show from the audience as well, the National Council of Jewish Women Sacramento Section is sponsoring a reprise performance of SEVEN at 2 pm at the Center at 2300, 2300 Sierra Blvd, Sacramento, with the same talented director, Jan Ahders, and award-winning cast. In a special appearance, playwright Paula Cizmar from Los Angeles will talk with the audience at a post play discussion and reception. NJCW Sacramento chose to reprise SEVEN in October in observation of Domestic Violence Awareness Month. The work of local organizations and their leaders who serve women facing violence and disempowerment will be featured at the event. “NJCW chose to produce SEVEN because the global concerns it addresses are reflected in local issues of concern to our organization, which is dedicated to improving the lives of women, children, and families,” said NCJW Board member Claire Lipschultz who brought the play to Sacramento.